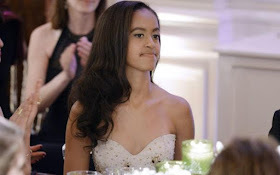 Former first daughter, Malia Obama, is tall, slim, beautiful and has all it takes to walk fashion runways so it's no wonder that modelling agencies are courting her, however, it's been revealed that the teenager has refused every modelling gig that has come her way. “Malia has the body that would be great for the runways, she’s been offered several opportunities but she’s turned them all down,” an insider said. Straight Shuter’s Rob Shuter has revealed that Malia turned down the modelling opportunities because of her love for TV. He said that she would rather be behind the camera, working on movie sets than on the runway. Malia's love for TV is one that has always been made public. Malia is currently in New York interning for the American film producer, Harvey Weinstein. This will not be the first time she will intern with a TV production company. In the summer of 2015, she interned on the set of HBO's 'Girls' filming in Brooklyn while she was still in high school, an opportunity many girls her age can only dream of. She got the gig after she met Lena Dunham, the writer, director and star of Girls at the White House and mentioned to her that she was a fan. Prior to that, in the Summer of 2014, Malia also worked as a production assistant for Halle Berry’s CBS show Extant. She was only 14 at the time. Malia has a passion for fashion and she is reportedly obsessed with shows America’s Next Top Model and Project Runway. In spite of that, she has no interest in making modelling a career. Another reason Malia refused the deals is that she would rather lay low and live a subtle life after eight years of being under the intense microscope of the world. She intends to focus on the film industry and she has dreams of going into production full time after college. Based on all these, there is very little possibility that Malia will be gracing the runways with the kinds of Kendall Jenner anytime soon.